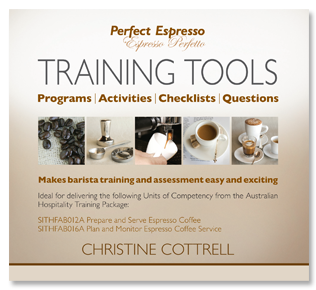 The Training Tools CD contains programs, activities, checklists and questions – 500 pages of every tool needed to organise espresso coffee training and assessment – effortlessly. Ideal for the manager in a café or restaurant or teacher in a coffee school or barista school. Turn your employee or trainee barista into an espresso expert with these training resources. Organised into 15 Quick Skills (2-6 hour programs) – ideal for informal training sessions in cafés and restaurants when time is limited. Excellence in Espresso (12, 30 or 60 hour programs) with 40 matching practical activities, competency checklists and over 500 test questions – designed to make formal training and assessment in any barista course simple and easy. I have been involved in the coffee industry for 16 years. In that time I have trained with plenty of coffee companies, done many barista courses and have also trained a lot of staff and barista's that now share the coffee passion, which is so addictive. Christine Cottrell is a one-of-a-kind! Christine's knowledge surpasses most coffee companies that offer barista training. Christine's well planned and meticulous books cover all topics to do with the coffee industry, it's training and practices. It will be a very long time before a person will ever be able to match what Christine has done. Christine is an absolute blessing for our industry. Christine has come up with an incredibly comprehensive and well thought-out training system. This has clearly been a labour of love. The attention to detail is meticulous and the variety of teaching tools is vast. From the chartys to the CDs to the books, everything is covered. There has been a dearth of training material available in the past, and this fills the void. It allows any size of institution to improve their coffee knowledge and barista skills, and then have a medium to use to pass this knowledge on to others in an organised way. Christine's passion for coffee and for barista education is infectious and the owners and staff at Blue Sky Coffee have embraced her training tools for ourselves and our customers.